“The best laid plans…” is an often-used expression that describes the plot in Harry Gilleland’s book, Zack’s Choice perfectly. Zack plans to marry his high school sweetheart and follow in his parents’ footsteps in the legal world. First, though, he decides to take a motorcycle trip through the south. In New Mexico his trip turns into a not-to-be believed adventure. He meets a young hitchhiker who convinces him to help save the world. What Bobby, the hitchhiker tells him is unbelievable, but Zack believes it anyway. Following Bobby’s directions, Zack’s journey takes him to California and then to Europe where he has to flee to stay out of jail. Don’t pass up a chance to read this incredulous story. The twists and turns and the subtly humorous dialogue combine to make you want more. Who knows? Maybe Dr. Gilleland will carry on the adventures of Zack. If not, you are le ft with a very unusual development that will make you wonder if something this fantastic could actually happen. Read it. Then decide. I always enjoy Dr. Gilleland’s books. His imagination and writing style keep me enthralled from beginning to end – and this book is no exception. If this is your first introduction to Harry E. Gilleland, you will definitely want to read his other works. Harry E. Gilleland, Jr. is an award-winning poet and author of nine published books, four books of his personal poetry and five prose books. He was born in Macon, GA, and has lived in Shreveport, LA since 1975, making him a proud and confirmed Southerner. He spent two long years in London, Canada in the snow, ice, and freezing - and I do mean freezing - cold. He moved back south to thaw out in 1975 and has no plans to ever leave the South again. Dr. Gilleland retired in 2004 after twenty-nine years as a Professor of Microbiology at LSUHSC-S's School of Medicine. Since his retirement, Harry has devoted his efforts full-time to creative writing, both poetry and prose, and to editing. Harry E. Gilleland, Jr. is a master at writing about the Middle Ages. He conveys the lifestyle without being gory and sensational. 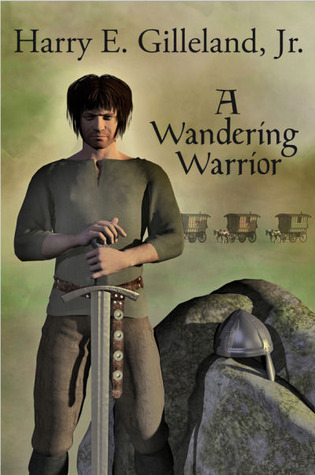 In A Wandering Warrior, he tells a story of knights, barons, princes and the ladies they love. He tells of battles, trials on the field of honor and saving ladies in distress. Thomas Beaumont is saved and brought back to health by a band of Travelers when he has been badly wounded in a battle. He then begins a quest to find and exact revenge on the killer of his brother. In his travels, he comes across two noble ladies whom he rescues and delivers to their home in Yorkshire. This eventually leads him to other exciting, dangerous adventures and to his love, Emalda. Due to dire circumstances, Thomas’ life changes – some good and some bad changes. When he returns to Yorkshire from a battle, he finds that his love, Emalda has disappeared with her family, due to her being accused of theft. Thomas begins another adventure to find her. His travels lead him to more battles and eventually to finding Emalda; they marry and have a short time together. OK, no more spoilers. Read the book to find out what happens. You will be surprised. Harry E. Gilleland was born and raised in Macon, Georgia and now lives in Shreveport, Louisiana with wife, Linda. Retired from a career as a Professor of Microbiology at LSU Health Sciences Center in Shreveport, he now devotes himself full-time to his writing. He writes poetry and prose as well as novels and novellas. Harry Gilleland is a very prolific and eclectic writer. His novels are exciting and attention-grabbing. They will hold the attention for older teenagers and adults alike. His poetry is for those who can understand the nuances and subtle humor, as well as those who enjoy poetry. This book, Poetry Books Don't Sell! is no different. He covers the gamut of poetry with a little prose thrown in for good measure. He has written some more storeoms (story-poems). Added to the mix is rhyming poetry, political poetry, acrostic, free verse and a bonus in the form of flash fiction and prize-winning poems as well as some of his favorites. Pick your favorite and go there or start at the beginning. You will enjoy your sojourn into Harry Gilleland’s writing world in either case. And if you buy this book it might make him re-think the title. having reached the age of 65. I’m retired, a job a thing I used to have. “At my age society considers me spent. Senior is what they call me; it’s my label. I wonder where all my past abilities went. I’m “used-to”, since I’m no longer able. Wait until you are a “used-to”, then you will understand – or maybe you already do. Harry E. Gilleland, Jr. is a southerner, born in Macon, Georgia and now residing in Shreveport, Louisiana with his wife, Linda. He retired in 2004 and now can spend all of his time with his passion for writing. During his ‘formative years’, he was a teacher of microbiology and a researcher. He attended the University of Georgia, where he earned a B.S. and a M.S. He returned from three years in the Army to go on to earn his Ph. D. in Microbiology from the University of Georgia and completed a two-year fellowship at the University of Western Ontario. In 1975, he joined the faculty at Louisiana State University Health Sciences Center in Shreveport, Louisiana. Harry E. Gilleland, Jr. has written a thrilling novel set in the 6th century entitled Aldric and Anneliese. This book depicts 6th century Eastern Europe when chivalrous knights abounded and ladies supported them. It was a lawless age where barbarian tribes traveled the countryside killing and plundering as romances flourished and knights fought wars with honor. Aldric is raised with Edmund who was to become king of the unified regions. Unfortunately, Edmund’s life ended soon after he became king in a battle through treachery instigated by his wife’s brother. After Aldric recovers from the wounds he received in the same battle, he sets out to avenge the death of his friend and king. Aldric’s adventures eventually lead him to an occupation he had never considered. With these words from Nikolaus, Aldric, through a series of circumstances, including winning battles and the counsel of Nikolaus becomes the new king and strives to unite the six regions under one Christian rule. Anneliese, Aldric’s first love, dies a tragic death. in due course he falls in love with and marries Ursula, Edmund’s former wife. In his quest to avenge his friend, King Edmund, Aldric solves problems of the newly united regions of the country, including putting down an insurrection in the last region and avenging the death of Edmund. Nikolaus, Aldric’s long time companion, helps Aldric administer the new country and provides valuable support. You will enjoy this book and the adventures of Aldric as he travels his newly united country to stabilize the region into one unified country. You will also enjoy his romances with the two women in his life, Anneliese and Ursula, as well as his adventures in war and peace. I found this book to be a “page turner” that will entice several age groups. I hope Mr. Gilleland will follow Aldric and Ursula as they continue their journey through life with their family. Harry E. Gilleland was born and raised in Macon, Georgia and now lives in Shreveport, Louisiana with wife, Linda. Retired from a career as a Professor of Microbiology at LSU Health Sciences Center in Shreveport, he now devotes himself full-time to his writing of poetry and prose. I have just finished reading Bob the Dragonslayer by Harry E. Gilleland, Jr. I laughed from the beginning to the end and am still laughing at the memories. This is a book that will delight all dragon legend aficionados who are mature enough to understand the double entendres and the plain old fun. I know I was delighted and I am not an aforementioned aficionado. I just like humor. Bob is just a peasant who wants to make something of himself. He decides dragon slaying and rescuing damsels in distress is the way to do it. He meets Stephen, a wizard, who gives Bob a magic sword that he calls Bruce (because he has always liked the name). Stephen weaves a tale about the sword having magical powers through being stuck into magic water that has poison in it. Since Bob sticks the sword into the dragon’s hearts, is it really magical? You get to decide. The story follows Bob through many adventures, including several dragon slayings and attempts at saving damsels in distress. Then he meets a man who becomes his best friend and champion. Sir Wilford, or Willie, as Bob calls him discovers a secret about Bob. Willie invites him to live in his castle for the winter, where Bob learns what a knight needs to know, such as fighting and court etiquette. Bob meets Lady Katherine, saves her from distress and falls in love with her. He accompanies her to her father’s castle, where they meet her father and Willie. Willie and Katherine’s father tell him of his true heritage. Bob decides to follow his destiny. He and his friends train an army and equip them with armor and weapons. There is a battle with the usurper king that ends with a happy ending for all except the enemy. You will enjoy this book for the humor and interesting twists in the story. Harry Gilleland will give you pause as you read his Poetic Musings of an Old, Fat Man, a sometimes reflective, sometimes funny and always contemplative book of rhyming poems and storoems (a term evidently coined by the author). You will laugh, cry and enjoy the thoughts that he has put into poetry for you (and himself). Mr. Gilleland covers almost all aspects of life in this book of poetry - home life, local events, world affairs and just plain old happenings. And just think - any of them could have happened to you at some time in your life. You will want to go back to these anecdotes in poem and storoem over and over to muse along with the author. As you reread them, you will find new and interesting outlooks in the wording, the stanzas or the whole work. Although this does not tell the whole storoem, it gives an insight to Mr. Gilleland’s sense of humor that is written into his book of poems and storoems and will persuade you to want to read more of this talented writer’s works. You cannot miss reading this thought provoking book, whether you are a poet at heart or not.